Pennsylvania and Delaware have both begun to build C-PACE programs in the past several months, with Pennsylvania’s governor signing C-PACE enabling legislation in June (Act No. 30) and Delaware’s governor following close behind in September (Senate Bill 113). The Pennsylvania legislation was passed through the Commonwealth’s House and Senate with broad bipartisan support. Individual jurisdictions will still need to opt into the program at a county or other municipal level before the program can be considered live. The Sustainable Energy Fund, an existing agency that facilitates clean energy and energy efficiency grants and incentives, will sponsor and administer and statewide program. The City of Philadelphia is expected to administer an independent program. The case of Delaware largely mirrors that of Pennsylvania. It, too, is now in a program design and county opt-in phase, led by the state administrator, Delaware’s Sustainable Energy Utility. The three counties in the state have already indicated their interest in participating in the program and therefore, we can expect to see C-PACE in action in Delaware within the next several months. As Delaware is Maryland’s immediate neighbor, the MD-PACE program expects that its registered contractors and capital providers will soon uncover an attractive commercial real estate market in Delaware. The MD-PACE program commends the Commonwealth of Pennsylvania and the State of Delaware on taking the steps to implement a Commercial Property Assessed Clean Energy program in their respective jurisdictions. 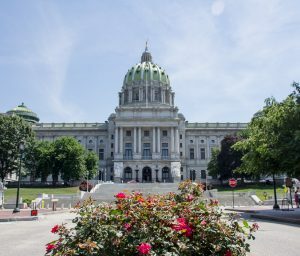 The passage of C-PACE legislation in Pennsylvania and Delaware lays the groundwork for the Mid-Atlantic to be a powerhouse of C-PACE transactions in the country. Alongside Pennsylvania and Delaware, New Jersey has a C-PACE program under development. Maryland and DC have fully fledged programs with multiple completed transactions and Virginia is in the implementation phase, with individual counties now opting into the program (Arlington County has opted in thus far). To the west, Kentucky and Ohio also have functioning C-PACE programs.